One of the most fascinating aspects of the Chinese language is its special writing system. Correct stroke order and proper proportion are vital to produce visually appealing characters. Using pen and paper to practice writing is the proven, most effective approach to learn and memorize Chinese characters and words. It is important to write Chinese characters properly from the beginning. Once you get bad habits, it is very hard to correct them later. Arch Chinese offers unique, innovative character worksheets and word worksheets to help you learn how to write them correctly and beautifully. You can generate handwriting worksheets quickly by entering (or copy & paste) Chinese characters into the Chinese character box and press the Print button. You can enter both simplified and traditional characters into the character box. The english definition and Pinyin will be pulled from our built-in Chinese-english dictionary. You can customize them as needed before you press the Print button. Click the Customize button to view and edit the definition and Pinyin of the characters as needed. Click the image icon to upload or look up an image for each character entry. Click the Save button to save the list, including the images, definitions, and Pinyin, for future use. 20. 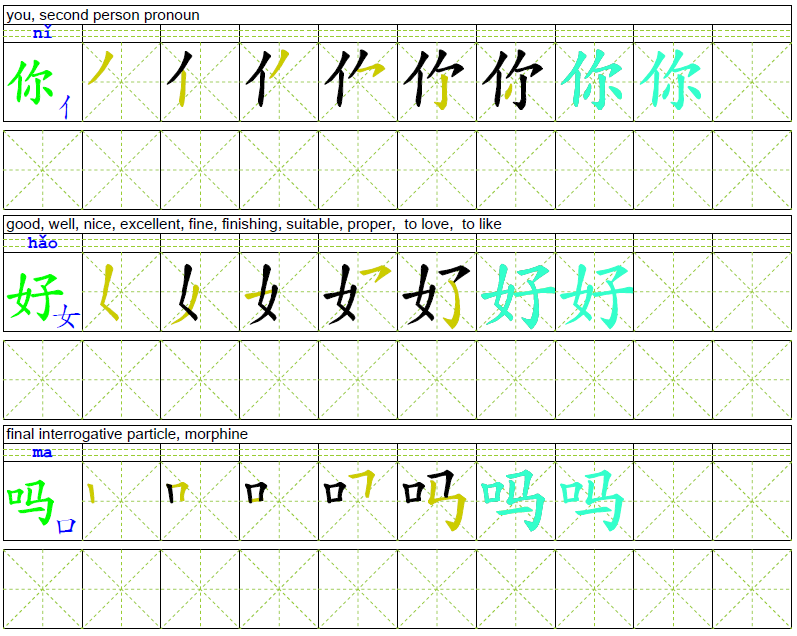 Create Pinyin spelling practice grids on the blank writing box rows (applicable only if option #8 is enabled). The system can generate worksheets for all the characters defined in the national standard character set of China and over 7,000 characters in the traditional Chinese character set. For performance reasons, it is limited to 50 characters at a time. If you want to generate more characters at a time, you can sign up as a premium member. Among other premium member only features, a premium member can generate worksheets for more than 200 characters at a time. You can change the worksheet settings to show the radical and character structure information on the worksheets. If the stroke sequence is too small to trace, you can adjust the settings to increase writing grid size or simply allow one stroke to take one writing box. To use images on the worksheets, enable the "Show the image of the character in front of the head character box" option and click the image icon to upload or look up an image for each character entry. You can change the stroke sequence style on the worksheet setting to show the stroke sequence of the character on top of the character writing boxes. At the beginner level classes, the Chinese teachers often want the students to practice writing each individual Chinese character stroke after they have learned it. With a few clicks, you can generate this type of worksheets easily. Because Chinese character strokes are not regular Chinese characters, they cannot be entered or displayed in the character box of this page. 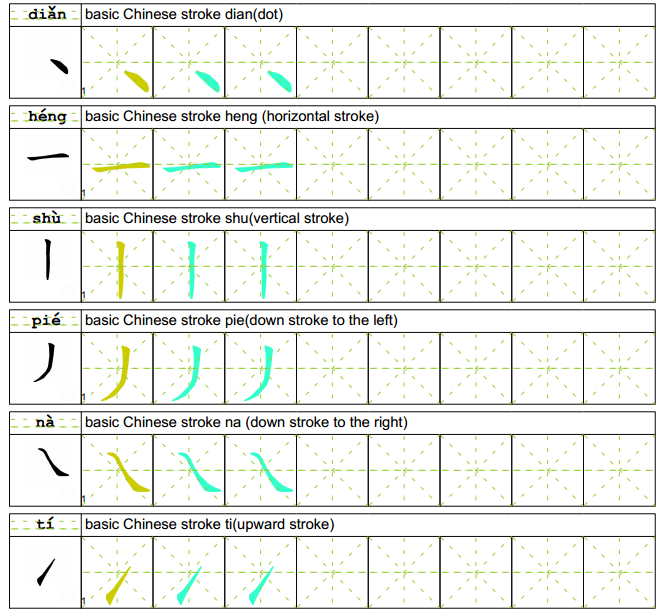 For your convenience, we have created two worksheet shortcuts for you to generate worksheets for the basic Chinese character strokes and the complete list of the Chinese strokes used in the modern Chinese characters. You can load them by clicking the links in the Commonly-used Character Lists box. To help Chinese students to identify and learn how to write the radical of a Chinese character, you can create Chinese character worksheets without showing the radical components of the characters. The students need to add the radicals to make the characters complete. You need to enable the worksheet option Do not show the radical components of the traceable characters to allow the students to fill them in. Optionally, you can adjust the worksheet settings to add the stroke sequences and/or hide or show the radical in the head character box. Both simplified and traditional Chinese characters are supported. Zhuyin (colloquially known as Bopomofo) remains the predominant phonetic system in teaching reading and writing Chinese characters in Taiwan. The Zhuyin symbols were derived from Chinese characters but they are not Chinese characters themselves. 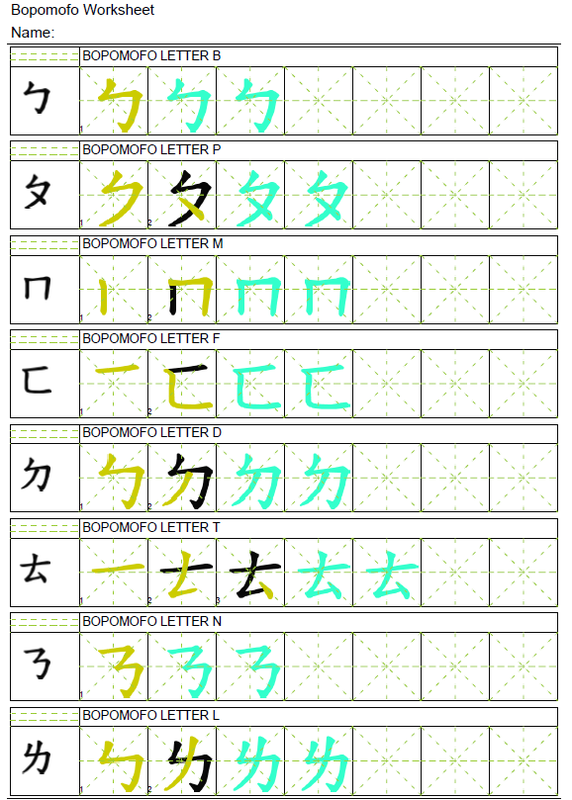 You can use this tool to generate Bopomofo worksheets as well. All you need to do is to enter the symbols and then hit the Print button. 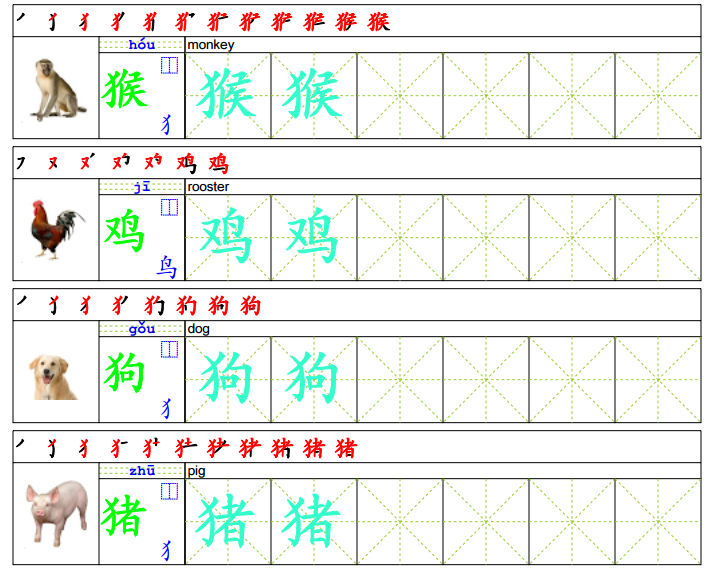 Like generating worksheets of regular Chinese characters, you can provide your own custom definitions and change the worksheet settings as you like. 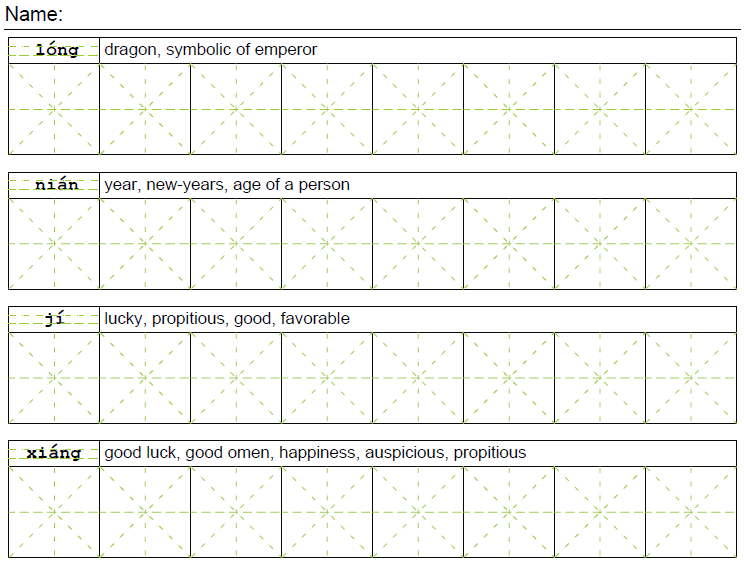 Enter (or copy & paste) Chinese characters into the Chinese character box. The system will automatically provide the English definition and Pinyin for the characters. You can edit the definition and Pinyin as needed. 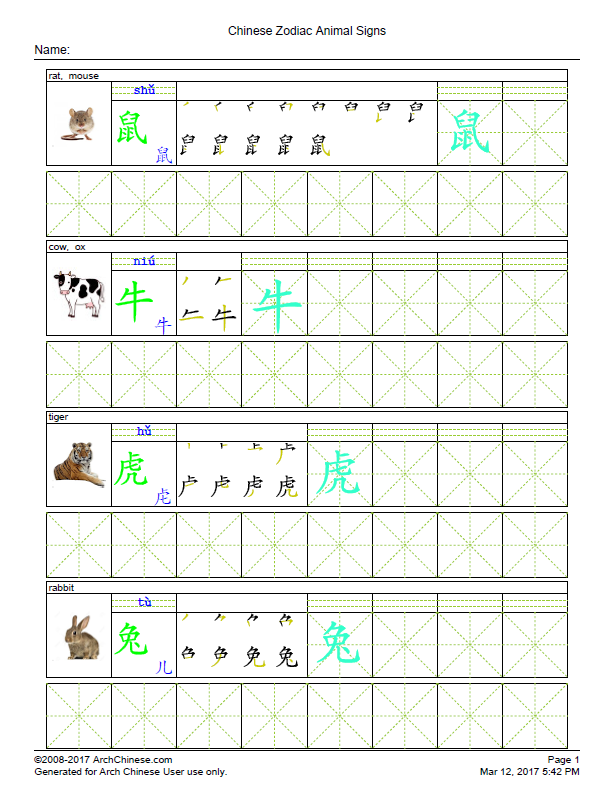 Optionally, enter the title of the new worksheet, such as Chinese Writing Homework #1. The title will be shown at the top of the generated worksheets. The title is required to save the list to the server for future use. Click the Print button to generate the worksheets. The generated worksheet PDF will be shown in a separate browser window. Optionally, click the Save button to save the character list, including the customized definition and Pinyin, to the server for future use. Instead of entering the characters into the character box, you can also generate a worksheet by loading a character list from your Saved Vocab Lists or find one from the vocab lists shared by the Chinese teaching and learning community. The chinese characters from the list will be copied into the character box and the definitions and Pinyin will be populated for you. Note that this site uses a pop-up window to display the generated worksheet. If your browser is configured to block pop-ups, you will need to allow this site to open pop-ups.